In Australia, households are provided with several bins: one for recycling (yellow lid), another for general waste (usually a red lid) and another for garden materials (green lid). The garden recyclinc bin is provided by the municipality if requested. Some localities have dual-stream recycling, with paper collected in bags or boxes and all other materials in a recycling bin. 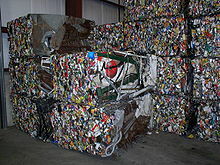 In either case, the recovered materials are trucked to a materials recovery facility for further processing.